Is there any update on this? Does iOS 9 make this any easier? Maybe I’m missing something, but this method isn’t an option on the Mac (Outlook for Mac 15.6). If I right-click on a calendar, there isn’t an option to publish a calendar (only Properties & Sharing Permissions). I also don’t see that option in OWA (Firefox 36.0.1). Frankly, dealing with shared/delegate calendars is a low-grade nightmare on the Mac. I’ll have to see if I can publish it from Outlook 2013. I mean, same as you have mentioned on your blog, but on 2007 eXchange server. Do they have that facility. Or is there another way? No, sadly it doesn’t have this ability. This was only introduced in SP1 of Exchange 2010 and never ported to Exchange 2007. Steve… I was able to publish calendar on Internet (but I have to replace HTTP:// as https://) but When I try to subscribe to calendar on iPhone or iPad its not working. Any thoughts? i to am having issues with ipads not showing the full details for the appointments. it only shows busy for the free busy info. this is a external user to my domain with appropriate permissions. any ideas what to check on? – I am on my iPad and visit an online calendar with ‘Export as iCalendar’ option, which I click. – At that point the details of that event pop up with an option button at bottom to “Add to Calendar”, which I click. -Now I’m presented with the option to add to an existing Calendar on my iPad, or I can select “New Calendar”, even under Exchange. -If I create a new Calendar, I can name it, add the event to it, and that new Calendar immediately appears not only on my mobile device, but also in my Windows Outlook 2010 client under ‘My Calendars’. Now, my question is, how do I flip this process? How do I get my additional calendars (created on my Windows device in Outlook 2010) to appear on my iPad? 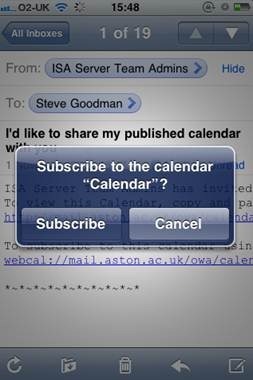 Furthermore, is there a way to get the Room Mailbox calendars to appear on the iOS device, without going through the ‘Subscribe’ process. Any way to get this to happen natively through Exchange? The bigger question though, is how to get these additional Calendars (created in the Outlook client) to display on the iOS device like they will in the reverse process I described above. Thanks so much, Steve. I learn a tremendous amount from you and the UCArchitects! Thank you all! Except the date for your article is over half a year later. This article was clearly the original. Not only was it published half a year *earlier*, the copied article’s screenshots have my name in. Not only that, the images (and links) in the copied article link to YOUR site! Is it possible to set up a shared mailbox on iPad? I don’t need the calendar, just my mailbox and a shared. My calendar shows just busy for everything. Ive enabled anonymous to view, but I the calendar still shows no information… Does anybody have any suggestions? Does the HTML link (provided alongside the iCAL link) show the correct information? Or you could just pick up LookeeLoo (http://itunes.apple.com/us/app/lookee-loo/id385456868?mt=8) and use it w/o needing to go through the publishing. Does your application honour these properties? EWS (GetUserAvailabilityRequest) handles the private appointment for me, so they come in as private to the query. I couldn’t display the real information if I wanted to. Also, if someone just has free/busy permission, but not meeting titles, they all come back as private. No worries, looks like a useful app. This is perhaps a bit of a rhetorical question but why is it up to the client to suppress private information? If a user sets an appointment to private, then Exchange should suppress it; otherwise the information is “out there”. Why should Exchange do it? The information isn’t out there to everyone, only those with permission to the calendar. Thanks for responding. The reason is: if I give you permission to look at my calendar but I set some of my info to private, then as things stand, there’s nothing to keep you from seeing my private info if you deliberately use a client that doesn’t respect the private flag. Even if I can’t find a client, I’ll bet it wouldn’t be particularly hard to write a quick & dirty script to extract private info if Exchange isn’t protecting it. Basically Exchange is exposing info (telling the owner that’s it’s private) while doing no more than politely requesting potential readers to avert their gaze. Maybe I’m misunderstanding but if not…that’s a bug by design. In any case, thanks very much for the info on Exchange config & iOS access. 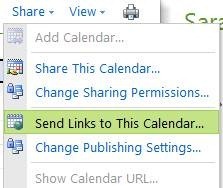 I’ll add something nifty I found in my environment: when an Outlook 2010 user clicks the link for a published calendar that’s been sent to them, it gets added to “Other Calendars” and then it also appears in their mobile device over ActiveSync. This works for both iOS and Android. More specifics: Exchange 2010; the shared calendar and the account that’s mounting it are on the same server. Well, it’s not always working. If your Outlook Web App is only available at https it’s not going to work because this calendar publishing asumes http is available too. Yes you are quite right, not only does it require that Exchange is setup so this will work, it also requires that the Calendar publishing is enabled. Yes, it seems to me that the calendar links in OWA is hardcoded to http which is not usable on our network. Our Outlook Web App is only available on port 443. I hoped this could be configurable, but haven’t found anything and probably have to wait and see if MS is fixing it someday. Currently this calendar sharing is only available to the users in our company smart enough to manually change http to https 🙂 Other than that, it’s a great feature.